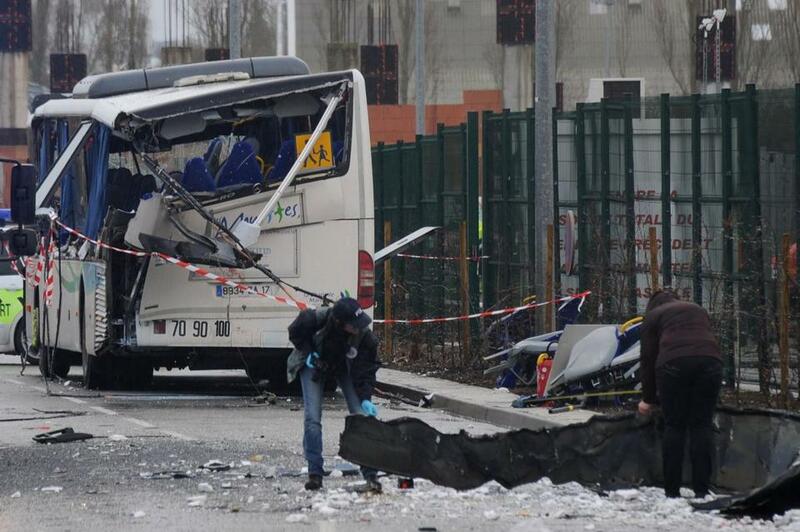 French forensic police working near the wreckage of a school minibus after it crashed into a truck. WASHINGTON (AP) — A jump in traffic fatalities last year pushed deaths on US roads to their highest level in nearly a decade, erasing improvements made during the Great Recession and economic recovery, a leading safety organization said Wednesday. Fatalities rose 6 percent in 2016, reaching an estimated 40,200 deaths compared to 37,757 deaths the previous year, according the National Safety Council. The group gets its data from states. The last time there were more than 40,000 fatalities in a single year was in 2007, just before the economy tanked. There were 41,000 deaths that year. The increase came as Americans drove more last year — a 3 percent increase in total miles. The council cited continued lower gasoline prices and an improving economy as key factors. Following an increase in fatalities in 2015, the United States has had the sharpest two-year increase in traffic deaths in 53 years, the council said. Americans have come to accept large numbers of traffic deaths as inevitable instead of than taking actions that would prevent them, said Deborah Hersman, the council’s president. In the last three years, 13 states have raised speed limits on at least some portion of their interstate highways. ‘‘Additionally, driver distraction and our society’s addiction to electronic devices is likely playing a role in the increase in deaths,’’ Adkins said. The estimated annual mileage death rate last year was 1.25 deaths per 100 million vehicle miles, an increase of 3 percent from the 2015 rate. Traffic deaths began dropping in 2008 and reached their lowest point in six decades in 2011 at 32,000 deaths. They fluctuated slightly over the next two years, but started climbing in the last quarter of 2014. As the economy recovered, people not only began driving more, but they also increased more risky types of driving ‘‘like going out on the weekends or taking long trips on unfamiliar roads,’’ said Adrian Lund, president of the Insurance Institute for Highway Safety. Teens, who have the highest fatal crash rates, are also back on the road after the recession when many of them couldn’t afford to drive as much, he said. The surge in fatalities comes as cars and trucks have more safety features than ever. Nearly all new cars and light trucks now have electronic stability control and rearview cameras, for example. Automakers are also beginning to equip more cars with sophisticated safety technology like adaptive cruise control, automatic emergency-braking and blind-spot monitoring that are designed to prevent crashes rather than merely make them survivable. Other important safety advances are also on the horizon, including vehicle-to-vehicle communications that allow cars to wirelessly warn each other of their movements in time to avoid collisions and self-driving cars that hold the potential to eliminate human error, a factor in more than 90 percent of crashes. The council’s fatality estimates differ slightly from those of the National Highway Traffic Safety Administration. The government counts only deaths that occur on public roads, while the council includes fatalities that occur in parking lots, driveways and private roads. Last month, NHTSA reported that traffic deaths surged about 8 percent in the first nine months of 2016.